A word game that requires a fast thinking in the English language. It can also be timed. 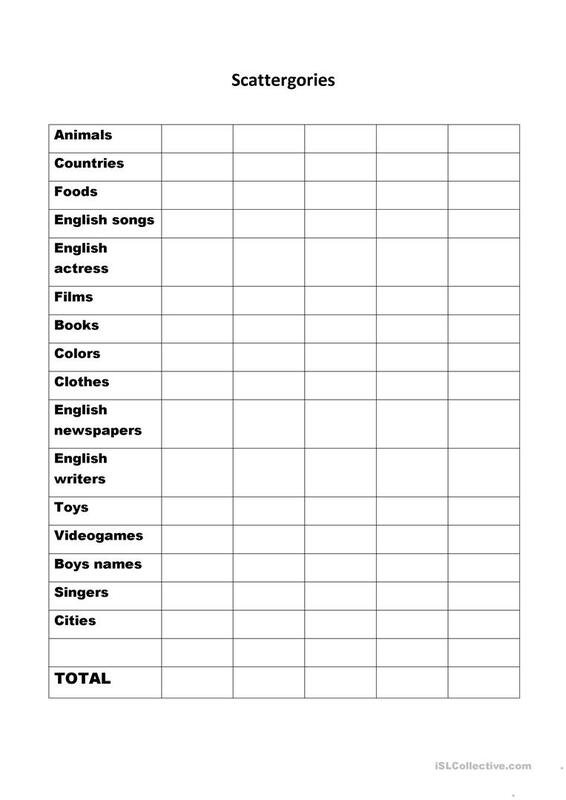 The aim is to find words in all categories beginning with the letter chosen by the teacher. It is a challenging activity and points can be set for the different answers. This printable, downloadable handout is intended for business/professional students, high school students and adults at Intermediate (B1), Upper-intermediate (B2), Advanced (C1) and Proficient (C2) level. It is excellent for strengthening your students' Writing skills. silviaprove is from/lives in and has been a member of iSLCollective since 2014-10-19 20:09:31. silviaprove last logged in on 2019-04-09 23:12:29, and has shared 3 resources on iSLCollective so far.